If you blog, you know this to be a fact: sometimes you connect with a fellow blogger and it is like you have known him/her all your life. Such is the case with Kelli of Kelli’s Kitchen. I have watched her blog progress from a WordPress site to the professional one she has today. Kelli is always full of advice and has offered me guidance regarding creating a professional looking site like hers (maybe someday) and how to create more traffic (like with Fave Southern Recipes and her own Yum Goggle). Why am I waxing poetic about Kelli and all her domestic art talents? Kelli’s Kitchen was my assigned C.L.U.E. assignment for May. Not only was I super excited to get my friend Kelli’s site, but I knew that I could find lots of delicious berry recipes there. The theme for C.L.U.E. this month included finding the best berry recipe ever. I think I found more than enough at Kelli’s Kitchen. Kelli learned to can from her grandmother and she has even written two canning ebooks (Nano-Canning: Basic Recipes and Instructions and Nano-Canning: Specialty Jams, Jellies, and Marmalades). A lot of Kelli’s recipes are heirloom recipes she learned from her Nana or other culinary diva relatives. A few berries from our garden. I always look forward to the spring’s bounty and canning. I especially like creative jams that have unexpected ingredients. I initially wanted to make Kelli’s Strawberry Balsamic Vinegar Black Pepper Jam but Kelli stated in the recipe that the jam has to set for one month for the flavors to meld and mellow. I wanted something I could enjoy now. 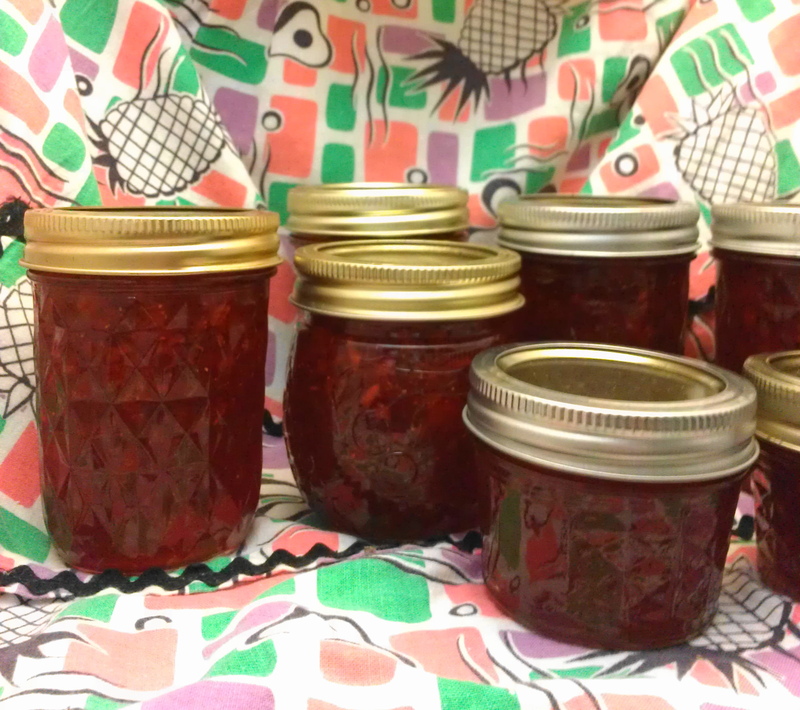 There was always her basic recipe for Strawberry Jam, but I couldn’t resist her Strawberry-Lemon Marmalade. Kelli states this concoction tastes “a bit like sweet tart candy.” I liked this recipe because I could start test-tasting as soon as it was cool. 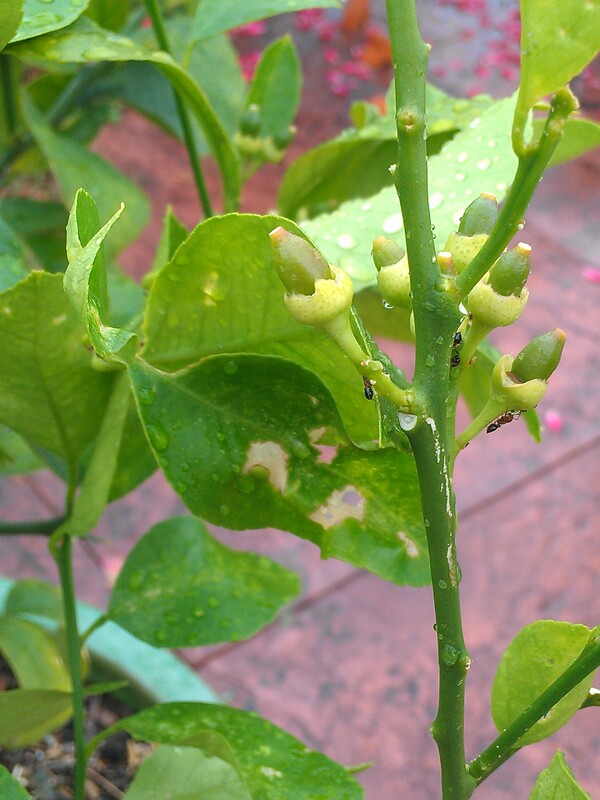 Lots of berries from Stillwell, OK.
Zest 2 of lemons being careful not to let any pith (white stuff) get in. Add to cooking pot. Peel all 4 lemons then cut and peel membrane off segments putting pulp into cooking pot. (Do this over the cooking pot so you can catch all the juice.) Remove any seeds. While stirring continually, bring to a hard boil and keep there for 30 seconds. Add sugar. Continue stirring, getting out lumps, and bring to a hard boil again, allowing to boil for 1 full minute. If it begins to splatter, put an oven mitt on, but continue to stir. Don’t skimp on the minute. Remove from heat and ladle into approximately ten (10) sterilized half pint jars. Place on sterilized flats and screw tops on finger tight. Lift into boiling water bath and process 10 minutes. Remove to a draft-free area to cool for 24 hours. *If using the no pectin method, using a candy thermometer, stir and cook marmalade until it reaches a temp of 220 degree Fahrenheit or 104 degrees Celsius and allow to stay at that temp for 1 full minute. What a great recipe! This has just the right amount of tartness. We have enjoyed it on biscuits, crackers, and on top of ice cream. I would definitely put this one in the running for my favorite jam with Peach Marmalade and Apple Marmalade being close contenders. Last weekend we were lucky enough to score 16 quarts of Stillwell strawberries. I plan to make that Strawberry Balsamic Vinegar Black Pepper with some of the leftovers, Kelli. For those of you who are unfamiliar with C.L.U.E. (or the Cook, Learn, Undertake, Eat Society), we are a group of like-minded bloggers who enjoy cooking, baking, sharing, and networking. For all my C.L.U.E. posts, click here. And, Kelli, I may be solo at a convention next October in Norman. Let’s plan something! 39 comments to Strawberry-Lemon Marmalade for May C.L.U.E. I loved that I had Kelli this month, too! Liz, you have to make some jam! wow..that’s lots of jam! Homemade tastes the freshest and best! And, this lemon marmalade tastes the best and freshest. I love unique jams/jellies and this is a must try. And that balsamic black pepper …. ohmy! Thanks for passing along those great finds. I know, Lea Ann. I just can’t help myself. I can’t make plain jam. 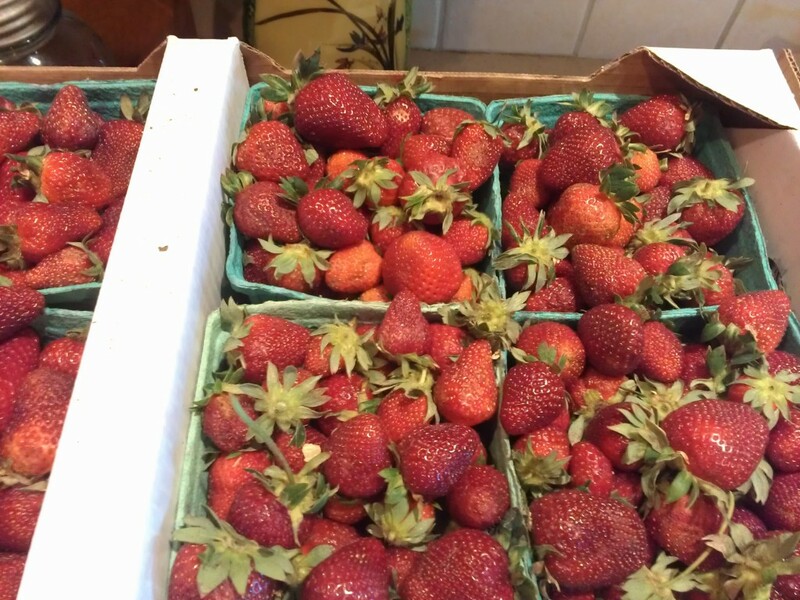 I’m so jealous that you have local strawberries already. I am keeping this recipe in mind when they finally ripen here in Michigan. Stillwell, OK, has a huge strawberry festival (which was last weekend). We are just getting handfuls from our strawberry bed. How fun to have a blogger you know (virtually speaking, in this case) and respect for your C.L.U.E. assignment! 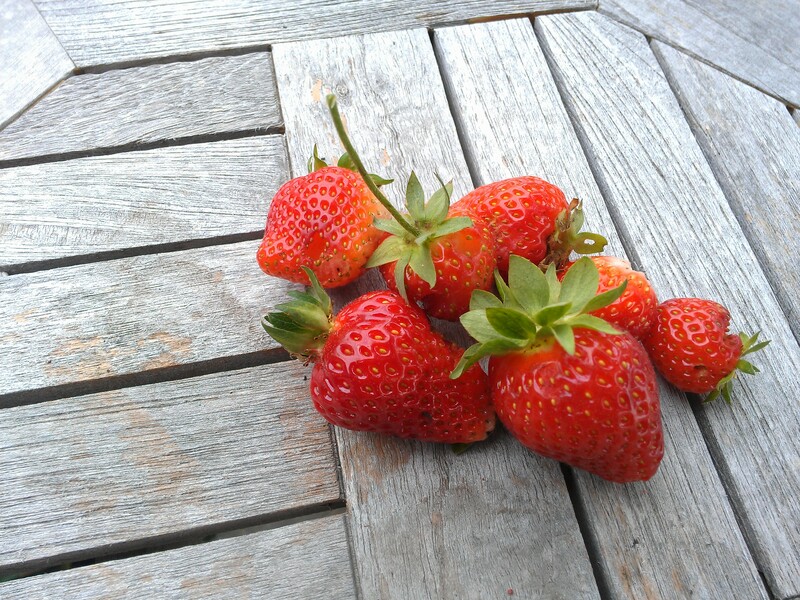 And such a timely dish — I’ve seen a few local strawberries, but just a few. So this will be the perfect recipe for me in about 3 weeks when I really expect to see a bunch! Virtually speaking, of course, but it is like I know Kelli. Mmmmm…I am busy thinking about an English Muffin with this wonderful marmalade! MMMMM…Now I am thinking about that, too. 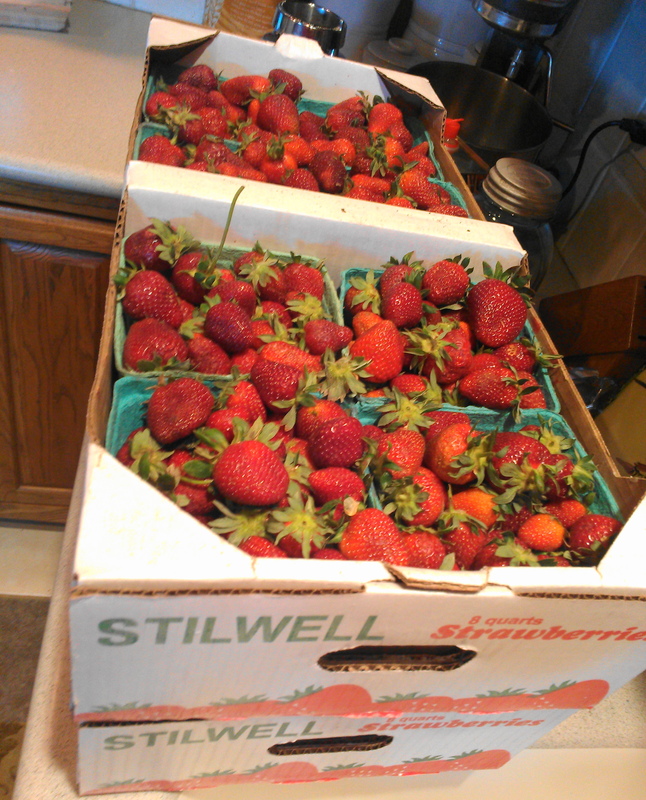 We got our Stilwell berries in Bixby. I passed out some of the jam at work yesterday (to special people only)!! Thanks for a keeper of a recipe! I’ll be there in October if they don’t change the location of the conference. 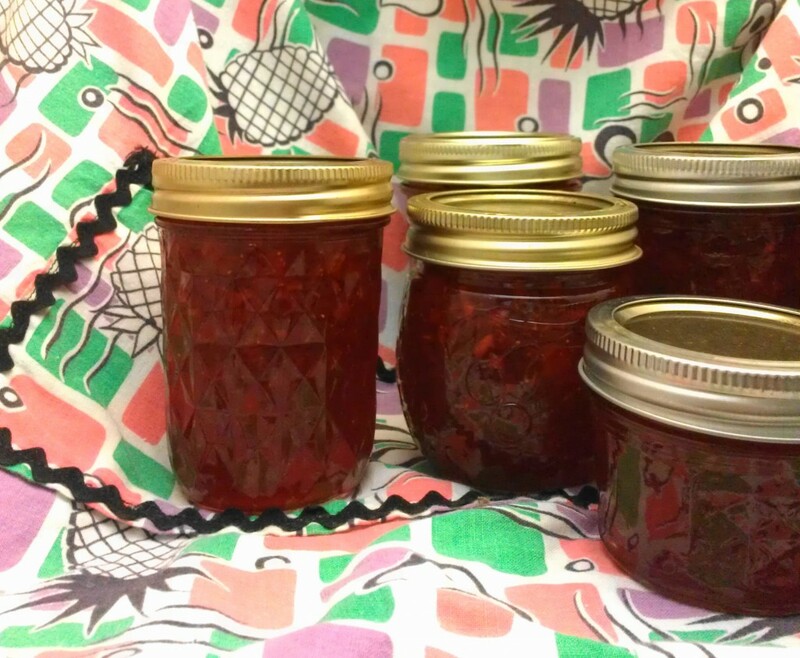 Your strawberry Lemon Marmalade sounds lovely! I would love to spread some on my morning toast! I love jam making! I grow several varieties of berries, and spend much of the summer making jam. I make too much and hoard it until the holidays, but I could not NOT share this batch. Delicious stuff. Passed out six jars this week at work. Oooooh, a bit like sweet tart candy? Sold! This marmalade really does sound fantastic, I need to make a batch. I think it is better than sweet tarts and I’m a sweet tart lover! So, I am more than intrigued by your strawberry cardamom combination. Yummy!! That sounds absolutely wonderful!! I wish I did liver closer. What a perfect Jam! Love the combination of lemon and strawberry. You can now enjoy this year round. Great choice! Strawberries and Meyers are a brilliant idea! And perfect for Cali… going to have to try this for sure! Ooooooh yum! Love that you went with Meyer lemon, too. It is definitely jam season with all of the berries starting to show up. Great idea to use Meyer lemon in a strawberry jam. Love this!